Getting up and downstairs is one of the biggest barriers to mobility around the home. The good news is that instead of having to move to a bungalow or a flat, Acorn Stairlifts have a simple and cost-effective solution. A stairlift allows you to continue living in and enjoying your current home. Installing a stairlift also means that you can have an accessible bathroom and bedroom on the first floor, keeping the downstairs for living space. Acorn Stairlifts are safe. They are made in Britain to the latest and most stringent UK and EU safety standards to provide trouble-free service. They fit to the stairs, not the wall. There is no messy and disruptive structural work and no drilling into masonry and plaster. Most Acorn stairlifts are available with next-day installation across the UK. The site survey only takes an hour. Acorn’s industry-leading innovations have helped win a string of awards, including the prestigious Ease-of-Use commendation from the Arthritis Foundation. Aftercare is a top priority at Acorn. In the unlikely event there is a problem with your lift, the dedicated Acorn help desk is just a phone call away, 365 days a year. There is also a range of extended stairlift warranties available from Acorn Stairlifts to suit any requirements. Acorn employ a team of highly-trained service technicians based all over the UK who are dedicated to servicing and maintaining customers' stairlifts. To ensure that every Acorn employee who comes to your home is someone you and your family can trust, all the technicians are routinely checked and all carry identity cards. A straight stairlift is the most cost-effective and simplest solution for houses that have predominantly straight staircases. Blending seamlessly into your home, with a smooth start and stop mechanism, you can glide effortlessly up and down the stairs. 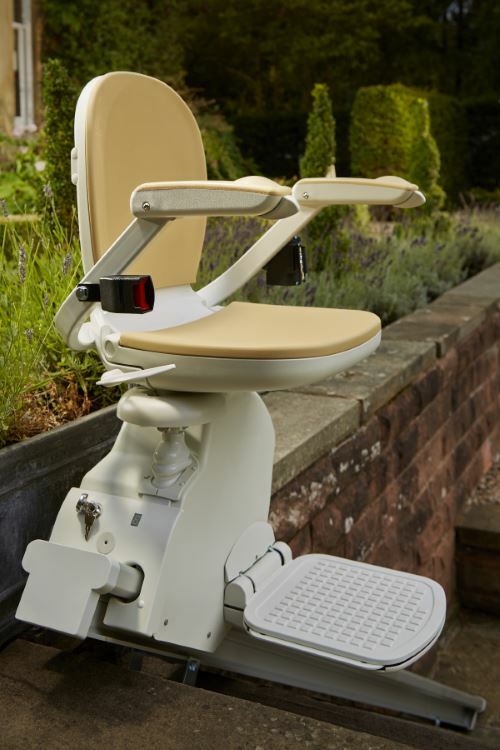 Continually developed, improved and refined over many years, the Acorn 130 is the direct descendant of Acorn’s very first straight stairlift, the Superglide. 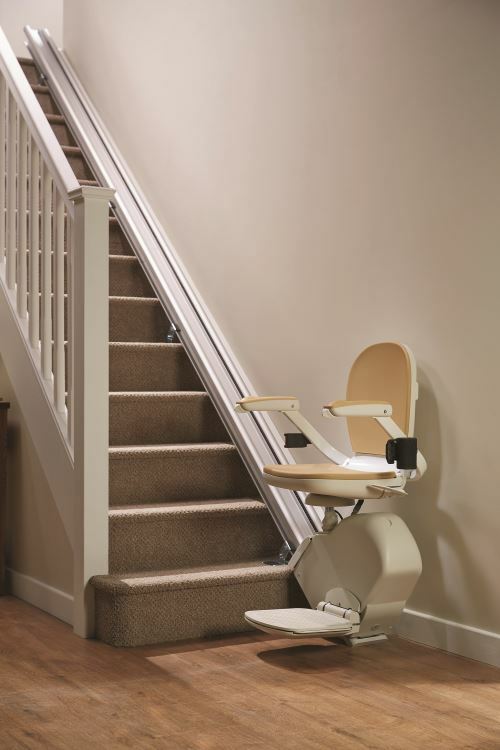 All Acorn Stairlifts are available with a unique hinged rail option, designed to eliminate any obstruction or trip hazard at the foot of the stairs. Acorn Stairlifts have all the features you need. Designed from the ground-up for any curved staircase, the curved stairlift offers a comfortable and reliable ride. The advanced self-levelling carriage moves along the modular rail system, coming to a soft stop with ease. Automatic powered hinges can be fitted when there is an opening or doorway at the foot of the stairs. An automatic powered hinged rail solves this problem. Do you have steps leading up to the house or a steep drive that is difficult to walk up? Acorn Stairlifts are not limited to your indoor stairs. Their outdoor stairlifts are the perfect mobility aid to give you access to those outdoor spaces you love or have limited access to. The Acorn 130 outdoor stairlift comes with all the features that can be found on our straight stairlift. For extra protection, it comes with a weather resistant outdoor cover. 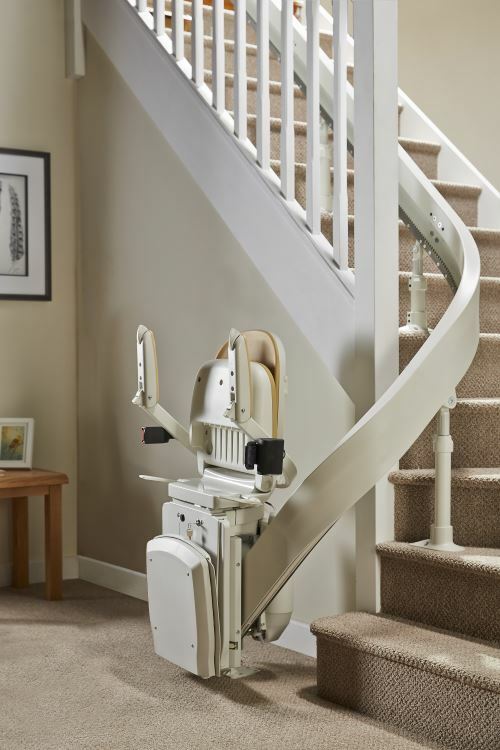 All Acorn Stairlifts are available with a unique hinged rail option, designed to eliminate any obstruction or trip hazards at the foot of the stairs.